P4 What are Natural Resource Charter precepts? Natural resource development may provide employment and other returns, but its principal benefit is the generation of government revenues to support development and the well-being of citizens. Realizing these revenues requires a well-designed fiscal system that takes into account the nature of extractive resources, the considerable uncertainties inherent in their exploration, and the capacities of the government. The fiscal regime is the set of tools that determine how the revenues from oil and mining projects are shared between the government and companies. 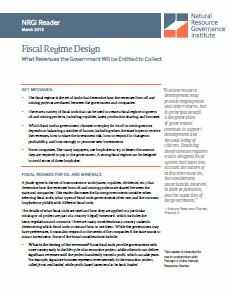 There are a variety of fiscal tools that can be used to create a fiscal regime to govern oil and mining projects, including royalties, taxes, production sharing, and bonuses. Which fiscal tools a government chooses to employ for its oil or mining sectors depends on balancing a number of factors, including when the state hopes to receive the revenues, how to share the investment risk, how to respond to changes in profitability, and how strongly to promote new investments. Some companies, like many taxpayers, use loopholes to try to lessen the amount they are required to pay to the government. A strong fiscal regime can be designed to avoid some of these loopholes.